The best ecommerce platform for small business is Wix. Wix lets you design stunning webstores in minutes, and it provides the tools that you need to run your ecommerce business smoothly. You can import product catalogs from any source, go online and start selling right away with its order and payment tools, and ship and deliver to happy customers. When it comes to ecommerce, strong will and sheer desire to collect your share of the booming ecommerce bonanza can only get you so far. If you truly wish to capitalize on this modern commerce goldmine—which is valued at a staggering US $2.8 trillion at the end of 2018 and reaching $4.5 trillion by 2021—you have to learn about the ecommerce tools that could empower you to navigate the cloud market successfully. The tools are varied: from virtual do-it-alls to online POS solutions, payment and financing systems, to shopping cart applications to help you get back on track with abandoned carts, a constant challenge to ecommerce operators big and small. Most of these applications offer multiple features and are priced reasonably to work with any budget. If you are just starting your ecommerce venture, it would be smart to choose one that meets your requirements without compromising your capability to finance other aspects of the business, while offering you a clear path to scale up as your business grows. In this article, we present the twelve leading ecommerce solutions out of possible hundreds, each one with features that you could depend on to help you succeed in the online markets. By looking at these applications, you save precious time doing it on your own, without any clue where to start. Aside from delving into the core features of these applications, we suggest that you also look into the reputation of the vendors when it comes to providing timely updates and customer support. Bandwidth and server reliability are also factors that you can consider. Lastly, you should opt to avail of a free trial when it is offered, to see the actual look and feel of the application and whether it agrees with how you work. What are the 12 best ecommerce solution best for small business? The big word in today’s ecommerce scene is personalization. Accenture reveals in a study that as much as 43% of customer express their preference of companies that provide a more personalized experience on their web stores. Furthermore, another 41% of these same customers are quick to bid adieu to companies that give them poor personalization options. But what’s to gain in personalization? The quick and easy answer lies in the figure showing that 48% of consumers spend more than they originally intended to when their experience is personalized, leaving them with happy faces while doing business with companies. The flipside is you had better get your personalization acts in order: as 74% of people hate being shown irrelevant content. Beyond personalization, consumers continue to show an undying passion to explore multiple possibilities when shopping online, with as much as 73% of them spreading their money over multiple channels while buying items. It’s an interesting time for shoppers, sure, but not without its own attendant problems. 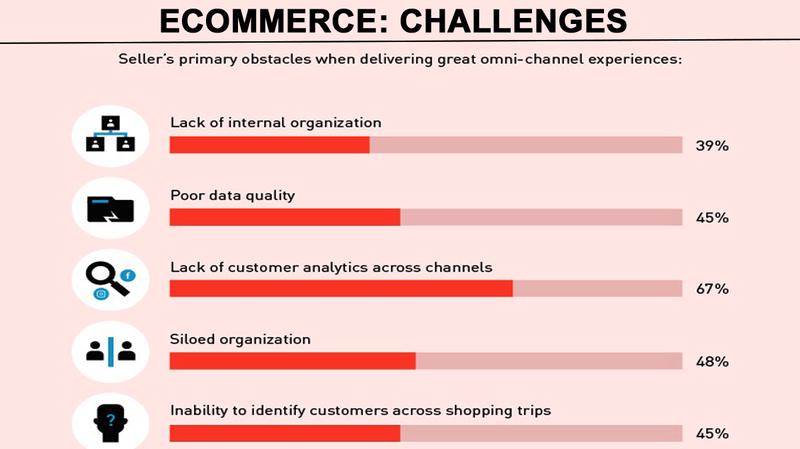 Among these, ecommerce operators point to lack of customer analytics that could tie up and make sense of varying customer behavior from any number of the major social channels, followed by organizations with siloed structure and suffering from scattered or poor data quality. Wix heads our list of 12 best ecommerce platforms for small businesses and for good reason: small businesses will find its free and basic offering—for $4.50/month—too good to pass up when working with limited budgets, while getting value that is many times the price of admission. Inexpensive does not mean cheap with Wix: the application has users covered with all the essential features they will ever need to make their online presence count and visibly felt in the ROI. First is the landing page to place your storefront. With more than a hundred customizable templates to choose from, the platform ensures that your first foray into ecommerce is as solid as it could be, through a careful balance between form and function, aesthetic appeal and business readiness. You can easily sign up for a Wix free trial here. Wix is fully mobile right out of the box, and extensive integration possibilities make it a winning proposition for any small business that are stuck with legacy or other third-party applications. 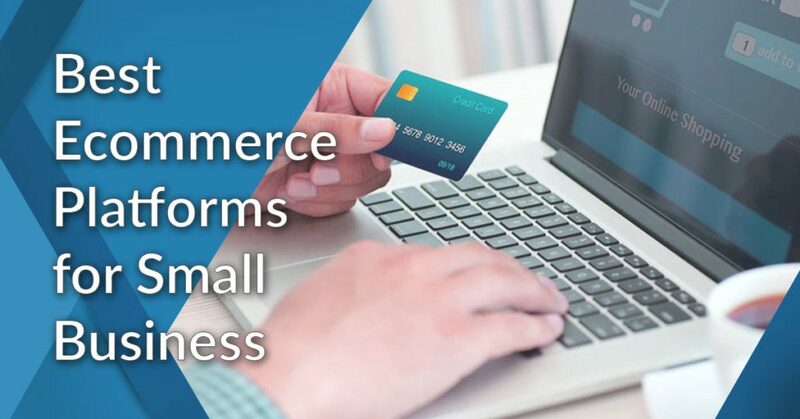 Designed for small and medium-sized businesses, cloud-based Shopify lets you create your own ecommerce store and expand your presence to major social media channels and other online marketplaces, with additional option for pop-up, physical store point-of-sale functionality. Shopify lets you start running your own storefront for just US $13 each month. The base plan already comes with unlimited product provision, as well as staff accounts and 24/7 support. You get manual order creation, discount codes and tools for abandoned cart recovery, an important feature when you are faced with shoppers who leave their carts for a number of reasons. You can easily sign up for a Shopify free trial here. Shopify delivers enterprise-level technology so you won’t have to worry about lost customer from annoying downtimes and poor bandwidth. Ecommerce is predicated on reliability and a clear path to scale, which Shopify offers in spades to small businesses aspiring to make it online. Another big name joins our list with Vend, originally a purely point-of-sale (POS) solution designed for iPads. A serious revamp of the software resulted in a full-blown cloud-based ecommerce platform, with modules to enable small and medium-sized businesses design stunning storefronts, backed with all the functionalities that Vend is known for: superb inventory control, unmatched payment processing system, customer management and the means to get your ecommerce acts in the right direction, a robust reporting and analytics tool. Still the core at the heart of Vend is its POS component, which closely links your product inventory with the point of sales, allowing you to watch out for depleting stocks and order fresh supplies accordingly. The new Vend lets anyone close orders from any device, and connectivity is no big problem: if you happen to go offline, your sales and other data are synced automatically once you are back online. If all these sound interesting to you, you can easily sign up for a Vend free trial here. Once your free trial runs out, you will find Vend offers a very competitive price for starting with the platform: US $ 99 per month gets you one outlet and 1 register installation. The package also comes with a Xero accounting software add-on, a great value if you don’t already have one dedicated accounting application. For sheer dedication to helping you find success in your ecommerce ventures, 3dcart easily wins out with its outright partnership with more than 200 leading ecommerce service providers, ranging from payment gateways, tax solutions and shipping services among others. These are on top of giving you all the tools to create and design your ecommerce store with fully customizable templates, or, for more visual appeal, you can opt to have a premium design made solely for your store. You can easily sign up for a 3dcart free trial here. Other essential tools to help you find your feet quickly in the ecommerce space are built right into the solution. There’s the social media integration to build your presence and find leads and customers through major social media channels, email marketing tools to get your marketing campaigns on, or a blog tool to ramp up interest in your website and start converting to increase your ROI. You cannot go far in your ecommerce pursuits if you don’t have a reliable shopping cart tool to facilitate quick and secure payments to begin with. PayKickstart is built upon this simple premise, and its customers agree, thousands of them giving the application a nod by way of getting the platform drive their store sales. You have to see to believe how far you can go with just US $29 per month, with tools for one-click upsells, email integrations, coupons and fulfillment integrations among a host of other tools. Moreover, PayKickstart does not collect transaction rates from you or your customers, a feature that sets it apart from other offerings. You can sign up for a PayKickstart free trial here. PayKickstart has a built-in tax system that is fully compliant with many territories, including EU countries, South Africa, Canada and more. This effectively prevents you from incurring additional costs for third-party tax applications. Your journey into ecommerce starts with a storefront that says in one look what you want to sell with as much professionalism or visual appeal as the nature of your business calls for. SITE123 is your accomplice in that journey, giving you all kinds of stunning templates to begin with, along with superior customization tools and a wizard to finish designing the look of your landing page in no time. And no, you don’t need to know a single programming code or extensive graphic design experience to make the most of the platform. The website builder is fully equipped with SEO tools to give your business a means to be included in search engines that matter, to help you increase visitor traffic from which to generate leads, create conversions, and boost your ROI. You can easily sign up for a SITE123 free trial here. Designing eye-catching storefronts and making your website SEO-capable are not what SITE123 is all about: it’s well capable of linking with your social media accounts of choice, and an email marketing module allows you to engage with prospects or longtime customers to build trust and loyalty to your brand. From do-it-all apps to shopping cart specialists, payment experts, order and inventory veteran, we move to another ecommerce platform to address another important aspect of your ecommerce journey: deep analytics tool to give you superior insight to the behavior of visitors and customers, which allows you to push your business to further growth territory. Here SellerPrime excels, an ecommerce solution that digs deep into your data and discovers patterns that you could not gain by any manual process. With clearer understanding of your customers, you can create marketing campaigns and advertising materials with closely targeted message and content, based on the segment of the population that responds well to your products or services. Imagine how that kind of information delivers if you are listed on the Amazon platform. You can easily sign up for a SellerPrime free trial here. SellerPrime not only tells you more about your market base: it also gathers intelligence about your competitors to inform you what they are about, a powerful tool to give you an edge that you could not otherwise gain via conventional business methods. Ecommerce is not all about roses and carnations: once you are faced with a volume of purchase payments stuck in the 14-day loop, you could be facing mad suppliers demanding payment, or miss discount opportunities when you could instead make a killing out of them. Payability gives you a financing solution so your money reaches your register faster, for as fast as next-day access rather the weeks of standard waiting period. If you are worried about your credit standing, you will be glad to know that Payability does not based its assessment on it; rather, it looks into your Amazon account health, and if it’s doing well, you can expect Payability to give you the financial lift you are looking for. You can easily sign up for a Payability free trial here. The financial freedom that Payability gives you allows you to keep a healthy inventory using your own money. This spares you from the risk of piling up bank debts if you are left with no other option but to go that way. Bigcommerce is your ticket to making it, well, big, in the ecommerce industry. The ticket is built on strong website design and creation tools, payment processing, SEO management, social media marketing and an API module so you don’t have to discard other applications that you are already using. If you really do make it big, Bigcommerce is ready for you there with its warehouse management, so you don’t get stuck matching sales and inventory and getting items into the hands of customers. Bigcommerce understands that one of the biggest hurdles to converting shopping carts to hard sells is a checkout process that makes would-be customers decide to leave in a huff rather than already owning them through an efficient process. Hence, its checkout process eliminates pain points and guides customers to conclude payments faster. Bigcommerce is also about business intelligence: a powerful analytics engine lets you dive into the performance of any product and the behavior of your customers. Possessed of such insight, you can design programs to improve areas and address problematic ones. Yotpo rides on the strength of user-generated reviews to help your brand gain trust, cultivate loyal customers, and increase ROI by boosting referrals and actual sales. It’s a unique addition to complement your other ecommerce solutions, giving you deeper access to social media and content to drive advocacy and continuous business growth. To give your ecommerce drive more edge, Yotpo recently came up with a technology called social curation, a revolutionary tool that directs you to Instagram user-generated content that enjoys huge traffic. Yotpo then lets you get in the act with easy moderation and rights management. No other platform gives you this powerful, innovative tool. You get the full value of what you pay for with Yotpo’s powerful analytic tool, which probes your data to help you improve your conversions and optimize many of your business practices. Looking to deliver a comprehensive, automated B2B and B2C ecommerce solution for small and medium-sized businesses is Jazva, offering services from product listing, inventory management, order processing and fulfillment, to shipping and delivery. Jazva enables superior automation by simplifying and integrating multiple processes, helping you attend to your ecommerce business in record time while providing responsive services to your customers. Its robust Multichannel Listing Tool enables you to incorporate listings from any site or marketplaces. The application capably handles any number of SKUs for real-time information about any particular item in your inventory. It handles Amazon integration and comes with eBay repricing tool on top of an integrated shipping solution, which should cover your ecommerce needs from start to finish. Wrapping up our 12 ecommerce platforms for small business is Nekom, a cloud-based omnichannel ecommerce application that automatically identifies B2B transactions and creates the necessary process to facilitate them. It comes with a built-in cash register to accommodate fast payment transactions, while a robust API ensures access to catalog management, order and shipping handling. It incorporates Alexa artificial intelligence to give you a voice-operated search capability and the level of business intelligence, business analytics and reporting that the famed program is capable of generating. A PCI-compliant company, Nekom undergoes inspection every three months to ensure strict financial implementation. It also has a strong fraud prevention measure to you give you a peace of mind concluding financial transactions over the internet. While any of these 12 ecommerce platforms for small businesses makes for a good option any day, you cannot overlook one last step before going out of your way to commit: get the free trial offer work for you and see in real time whether it actually is as good as the paper says. For Wix, for example, you can easily sign up for a Wix free trial here.